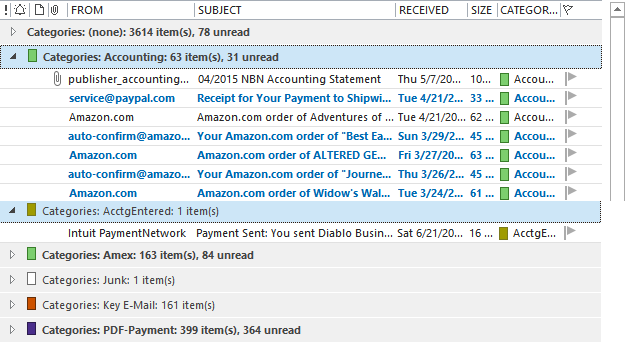 You may know that I highly recommend using Outlook Categories instead of using multiple Outlook folders when filing mail. Categories take a little time to learn at first, but after that they are very easy to use. Best of all, they save a huge amount of time when compared to using topic-named folders. You can apply more than one category to an e-mail, so you don’t waste time trying to decide which folder to put it in. The e-mail shows up in each category group without taking additional space. Categories can be grouped in your single-folder filing system, which makes visual searching easy (more on that below). Outlook rules for auto-filing incoming mail work much better when filing to categories than when filing to folders because they leave the e-mail in the Inbox where you can still read it. Then just drag all mail you are done with to the single folder. As I just mentioned above, once you apply categories to e-mail, you can file them in a single folder (I call it the Processed Mail folder). Then, when you need to search for them you can group them by category as shown in the image above—it’s similar to having a set of folders all in one folder. You have all the advantages of a single folder, and all the advantages of a multi-folder system. To learn more about using Categories for filing Outlook mail, study Chapter 8 in my Outlook book, or study Lessons 17 and 18 in my Outlook Video Course. My iphone does not be able to search on category. Is it a set version of Outlook or iphone? I use categories as part of my task management process in outlook and for categorizing my tasks, but haven’t had a lot of luck using them as part of my Email workflow. I have found that I use high-level folders to file my messages, and then use the power of the Outlook Search tool to find messages when I (rarely) need to locate them. However, I definitely do see that using categories can be a nice alternative to replace my current high-level folder system. As stated by Erron above, a problem I have with categories is that because I travel quite a bit and use my iPhone for Email, there is no ability to categorize Emails using Apple’s Outlook iphone app. It will let me “flag” a message or move it to a folder, but no option to categorize. I think its just a limitation of Apple’s iphone app. This means I can’t really “process” my Emails using my iPhone, and would have to “double touch” them again when I had access to my laptop. That is why I stick with “flagging” for items I want to follow-up on and moving to my high-level “folders” for items I want to save for future reference (PS: I still miss my old blackberry – not a great web or application device, but boy was that thing great at synching my Outlook Emails and it had so many more Email management options). -3–consider using a small windows tablet when mobile, one with a full desktop copy of Outlook. Unfortunately, because my iPhone Mail is part of my corporate email system, I don’t have the option to change to another Iphone client…. I’m stuck with the native Mail app.. But agree that the best approach is to file what you can on the iPhone, and then do any categorizations when I am back on my laptop with access to the native Outlook client. I don’t do a large amount of categorization for Emails.. I generally only categorize my tasks and try to rely only on a few high-level Email folders and the power of Outlook “Search” to find things. I probably also need to look at building out a few more “auto-categorization rules” for my incoming Email. That will definitely reduce the amount of manual categorization I need to perform. How do you filter emails by categories in touchdown ? I find the filters list for the contacts, but nothing for the emails. Here is another reason to prefer categories over folders: When you store mails in different folders, you normally define special views to apply to those folders. Keeping the views accurate is an arcane, very user-unfriendly process in all Outlook versions. When you have only one (or a few) folders, that’s still manageable. However, when you have many folders, it is almost impossible to ensure that they keep the view(s) you want correctly applied. There are lots of issues, and I do not have enough space here to go into detail… just try to stick with as few folders as possible if you care about views. I’ve been applying Categories to my Contacts in Outlook 2016 and recently realized that the Categories don’t carry over from one laptop to another, or to the Outlook.com online access. They seem to be device specific and don’t sync… which defeats the purpose of using Outlook across multiple devices for easy access. Have you experienced this challenge or discovered a solution? Do email categories sync across devices? @D Levin. If you have an Exchange Server in the back end, like Exchange Online ($4 pm) or Office 365 Business Essentials ($5 pm), categories will sync. My other answer is a ‘maybe soon’; Microsoft are transitioning Outlook.com to the same Office 365 web mail user interface. This may offer category support. Maybe. Thanks Craig. Currently I’m on Office 365 Home (~$9/mo? ), which uses “Exchange ActiveSync” and syncs contacts across my multiple devices fairly accurately. It even syncs photos when I’ve added them to a contact. however, once outlook.com gets involved, all bets are off. “Groups” of contacts seem to sync properly with Outlook 2016, but “Categories” from Outlook 2016 contacts don’t sync at all. It’s amazing that a multi-billion dollar company like Microsoft can’t seem to figure out how these products should work, and can’t provide any guidance on Best Practices. I’ve spoken to tech support escalated to their research team, and still find many more questions than answers. Yes! I have the same problem. I have been using the Categories in Outlook to organize my email addresses for 14 years now! How many laptops have I migrated to in 14 years? Enough to make me hate Categories! But it is the best way to organize thousands of emails. Come on, Microsoft! It should not be this difficult to migrate (look at Apple’s Migration Assistant). Thanks for your blog. I am a great supporter of the use of categories instead of folders for all the reasons you and others have cited. I am a partner in a small legal practice in Australia and file my work emails (through Exchange) by categories defined by file reference numbers and short descriptions or (for non-client items) by category names I have created. I also have equally as busy personal email accounts and use categories created by subject or project in those accounts. For both, I use saved advanced Outlook searches where the search for “contains” equals the category name, giving me instant access to every matter (for my legal work) and subject or project (for personal or non-client stuff) that is identical to that subject or project name. My results include emails in the Inbox, Sent and Drafts folders, but the whole email account (all folders) or other folders can be selected, so existing folder structures can be used or ignored. In other words, all the benefits of a dedicated folder but with much less decision-making and true one-click ease – and a much better chance of finding the right email. It works brilliantly, in my opinion. In these days of large capacity inboxes, there is no need to worry about a folder structure for saving space. The inbox can be treated as what it in fact is, a large searchable database. The same “hygiene ” rules apply for diligently deleting unwanted emails and moving old emails to archive, but the latter is made so much easier by using a category search to define what emails can now be archived into an archive folder that is set up at the end, rather than created at the beginning . The key is ease of categorisation, and I found rules and Outlook’s native functions to be poor and unwieldy. I turned to third-party software that worked with Outlook. I first used “Category Manager”, which worked well till recent equipment and Windows upgrades, and I now use “Categorize Plus” which works exceedingly well as an Add-in and sidebar, and was not expensive. I recommend it strongly but others can look around, and no doubt there may be other products. I understand the iPhone and other devices issue, but since I treat those devices as convenient readers and occasional responders, rather than as primary tools, I am happy to categorise emails later when I get to my primary email device (a laptop), and I don’t find a real need to search for items at the category level when I am away from it – but others may be different. I hope this helps spread the word about Categories, and I am looking forward to reading your Outlook books soon. Great comment Michael and very helpful. I’ve been categorizing emails for a long while now and find it more convenient than having folders. However, I now have problem with archiving the emails. I do not want to archive any emails based on the date but rather based on the category. How can I do that? I have been using categories for years for tasks quite happily. I am very frugal with the number of categories I use so that the ones I want are always at the top of the pick list. I recently started using categories for appointments and I’m having issues. Can you help? I am an instructor and I create a category for each class. In the past when a class if over I just delete the category. Things have changed and I want to be able to go back to an old class so I don’t want to delete the category. I’m also interested in categorizing emails. How the heck do you managed the category names so you can find them? I have had terrible results when I change the names of a category – it goes off the master list and then either everything is messed up or I can’t synch between my home and office computer. Hugh, yeah, I find if the category list gets too long, it becomes very hard to manage. No way around that. Not sure the issue with changing category names. But as to your first point, I think your original plan to delete them is correct. That removes them from the master list and keeps it reasonable in size. Is there a limit to how many categories you can have? Yeah categories are much preferred. My work mail is Outlook containing many dozens of folders. I use Gmail for personal mail since it first came out and adopted its category equivalent “labels” pretty much soon after. Quick question: is there a whizz bang macro way of converting Outlook folder names to categories and tagging the mail in them with their new equivalent category name BEFORE I starting moving and deleting all my old folders? Does anybody have a best practice for managing out of date categories? Over the years, I’ve genetrated several categories. Now I have a number of categories from old projects etc that are no longer useful. I would like to clean up my category list. What are some ways to manage categories from projects long ago? I was thinking of same issue as I am starting up in new business and want to structure up from start. I read about the outlook addin Categorize Plus that someone mentioned above. I think I will try that during 30 days to see how it works. Below link show you make hierarchies of categories and the have example of Project categories and additional categories active and completed which may solve your problem . Jan/Michael, thank you for the responses. I’ll be sure to check out the links Jan.
Michael, Thanks for the page reference, I have the book and will check it out. I’ve been a big fan of your system since edition 2, and recently purchased the 5th edition.